City Directories prove to be an excellent source for researching individual and family history. They fill the void over the ten years between United States censuses. The first City Directory for Hagerstown, Maryland was published by John Randall in 1893. Earlier (1884-85) a combined directory for Hagerstown and its neighbor to the north, Chambersburg, Pennsylvania, was printed. The 1893 directory listed adults alphabetically but did not group family members together as would be done today. Only by checking the addresses can spouse or other persons living in the same residence be found. For example there are thirteen persons with the surname Feigley listed. By scanning the addresses James E. and Margaret Feigley can be seen to live in the same residence, 108 E Antietam. The 1893 edition also lists the occupation of the residents, allowing the researcher to find occupations such as sawyer, lamp lighter, founder, silk weaver, brick molder, oyster, spoke turner, cigar box maker and call boy. In addition, it lists "coloreds", abbreviated as "col". The 1893 directory is for the city of Hagerstown only. It was not until 1908 that the first county directory was published. Also of interest in this directory is the list of classified businesses and a directory of patrons. The details of the 1890 United States census were destroyed in a fire, making this 1893 listing of residents even more valuable. 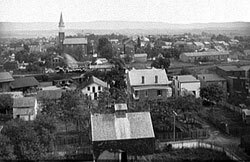 The U.S. Census Bureau estimates the total population of Hagerstown in 1890 as 10,118. --- Williams, Thomas J. C. (Thomas John Chew). Hagerstown; an illustrated description of the city of Hagerstown, Maryland, showing its advantages as a place of residence and a location for manufactories, &c., &c. Hagerstown, Md., Mail Publishing Co., 1887. Pauline Leitner of Hagerstown assisted with the transcription of the text.